When Seth Burkett travelled to Brazil for a youth tournament with his local team Stamford, he was stunned by what happened next. Spotted by a scout, he accepted an offer to join Sorriso Esporte Clube in the central state of Mato Grosso and became a media celebrity as well as the only English professional in the football-crazy country. THE BOY IN BRAZIL is a charming and insightful account of his magical season in the sun as an 18-year-old in Sorriso - Portuguese for smile - and takes a bittersweet look at the beautiful game and cultural concerns of the vibrant nation which would host the 2014 World Cup finals. On his journey from boy to man, he would discover an uncanny and unexpected family link to the foundation of the sport in Brazil. He would also come to see, through a tragedy in Sorriso and the sad fate of its football club, that a childhood dream joyously fulfilled also had a dark side. SHORTLISTED: Best football book, Cross Pens British Sports Book Awards 2015. Loved every page, couldn't put it down. Thoroughly recommended. 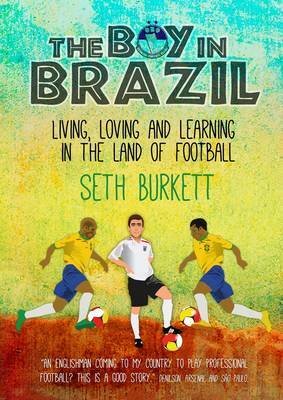 As someone who's a football fanatic, loved Brazilian football since I was a child, & who also loves to travel this book combines all 3 in a fascinating & highly enjoyable story.